Everyone knows the printed bangers, those polythene sticks often used during sporting events to cheer on your favorite team. Today, I would like to introduce a new item: the LED cheer stick. They are fantastic, especially for indoor games and concerts. They light the room with your chosen colors thanks to their LED light bulbs. The banger itself is also printable in four colors maximum, in order for you to reproduce your logo on it. Horizonsources makes high quality printed bangers, these are equipped with an inflation valve. In case your bangers are deflated, we provide a straw which will allow you to inflate it. Your personalized bangers will stay inflated for a long time. 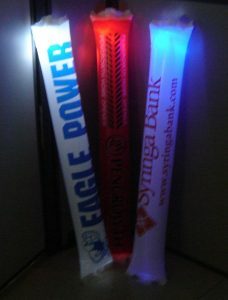 You wish more precisions about the LED cheer stick and all its possibilities ? Do feel free to contact us by phone (+33 4 76 32 80 50) or email (hello@horizonsources.com).